…Anyhow, this is not a post about the workforce. We’re taking a break from that, finally. Here’s the thing. LEGOs ain’t cheap. You’ll pay about 5 to 10 cents per brick, and with most kits averaging around 300-400 pieces, you’re dropping $30 for a pretty basic set. The co-branded kits, like Star Wars and Harry Potter are especially pricey, at about 10 to 15 cents per brick. Some people go absolutely hog-wild over LEGOs. They can be an addiction of sorts. One guy confessed to spending over $45,000 on the fantastic plastic. 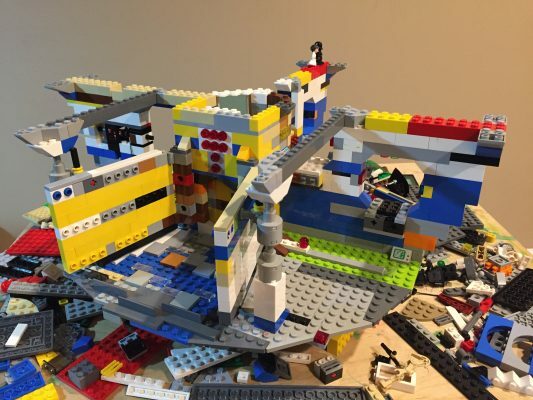 From what I’ve read, adults have been using LEGOs as a way to destress and decompress. Building something either from the instructions, or with your own creative blueprint can provide a form of therapy. In fact, I watched a YouTube video with my son about a troop stationed in Afghanistan who had kits sent overseas to him. Now back in the states, he builds sets to keep the PTSD at bay. So, we know these toys are very expensive, but they’re also a source of joy and can offer some real mental-health benefits. My hope is to keep our little household collection alive and well, but with a frugal spin on the situation. Step 1: Combine your kits. This is easy enough. 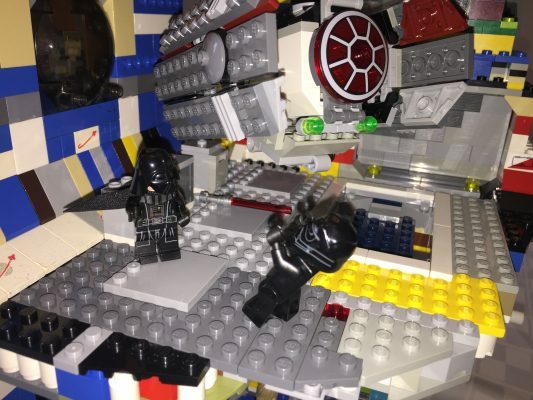 If you had LEGOs as a kid and you’re still hanging onto them, don’t let them sit in the attic collecting dust. Dump ’em in with the kids’ collection and be glad they’re being put to use. 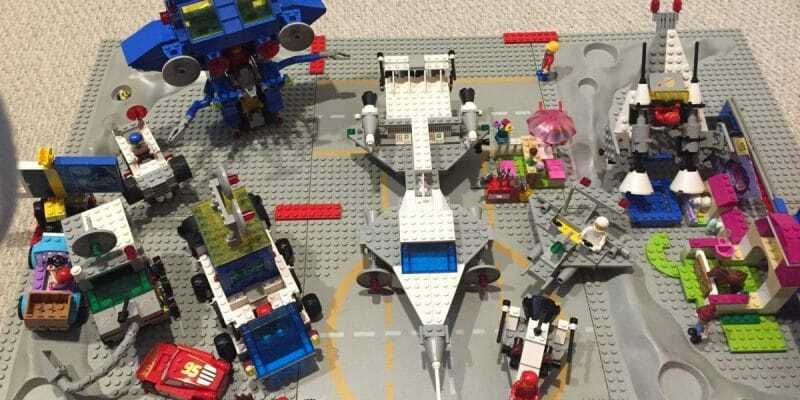 I had a five pound tote of plastic from my childhood — all classic LEGO space kits. The kids have no problem plugging those gray and blue pieces into whatever they create. Step 2: Watch YouTube for homemade ideas. We built a sweet little Minion my daughter thought was the bomb. 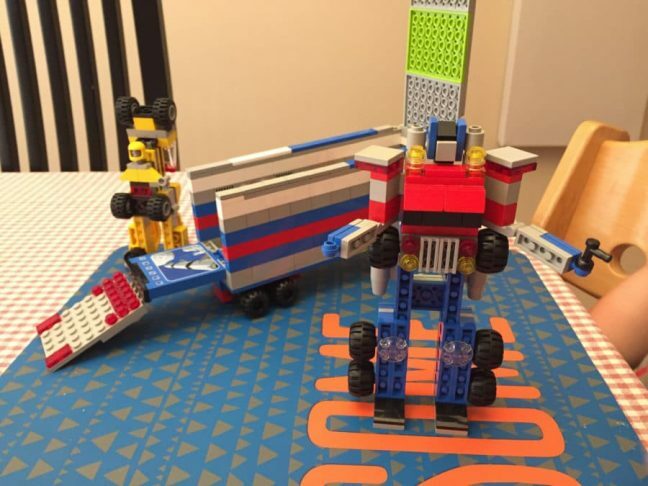 My son and I got to build a LEGO Optimus Prime. There’s pretty much no limit to what you can build with these bricks. In most cases, our own ideas are better than the original kits themselves. Step 4: Download the official instructions for kits from LEGO.com. Now you’ll know how we spent our free time during the Polar Vortex last week. Papa had a crazy notion that all the random kits combined, including some donated pinks and purples from my daughter’s Friends collection, would be sufficient to build a…. DEATH STAR!! For some background, the LEGO Death Star kit is massive. (No affiliate link there, btw.) It’s a $500 kit ($500!!!) before tax… and includes 4,016 of the finest black and gray plastic bits you could ever hope for in your collection. But who’s going to deny the most fanatic of Star Wars fans?? But ask good ol’ Cubert if he’s going to plop down $535 and change…. Nope. Thanks to LEGO’s altruistic understanding of how the instruction booklets often get lost or shredded by the dog, they offer .PDF versions online. So, I decided to download the official LEGO Death Star instructions and go for broke. Want to know how many pages this novel is? Two Hundred and Sixty Four!!! Gulp. But we all chipped in though, and before long, the Death Star began to take form. Only this version would be known as “Disco Death Star”, thanks to those beautiful purples, blues, oranges, and yellows that blend in with the grays and blacks that dominate the real deal. The neverending project. But each level completed was a small victory! The Ewoks were replaced by Care Bears. A better fit for this Death Star? I felt like kissing it too. It was a labor of love for everyone! The smiles betray a desire to blow it up, just like in the movies. Notice the pizza break at lower right. Blowing up planets makes one hungry! Darth was none too pleased about the multi-colored hangar his troops had constructed for him. What’s a loving father and mother to do? We both scoured eBay and Facebook markets for spare parts, of course! Eventually, I stumbled upon a five pound collection of a mish-mash of Star Wars kit pieces. Buy it Now cost? $30. Granted, shipping was $20. Still, for $50, we were able to finish this project 99.7% to specifications (if you are color blind). Ultimately, we had little problem plunking down $50 to complete what otherwise would’ve been a $535 kit, if purchased from Amazon, Target, or wherever. Our kids would probably disagree, but the added challenge of hunting to find pieces we weren’t sure we had was all part of the fun. When you buy the kit – it’s all there in sorted packages. You just do the grunt work. On the flip side, if you try a hair-brained idea like mine, and download instructions with the HOPE of having the pieces, you’ll be playing scavenger hunt for hours in those multi-colored bins. Oh, that reminds me. One last tip – It really, really helps to sort your pieces by color group before you take on a project like this. Happy building, kids!! 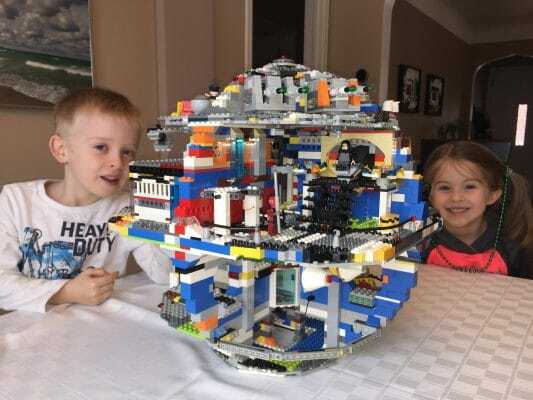 Very impressive work on the homemade Death Star! Also, glad to hear you survived the no school days last week. I was getting worried of delays this morning with all the ice but everyone made it to school in good time :). Thanks, Eric! It was a rough week for figuring out kid coverage and all the ramp up of projects going at work. Cute little humans you have there! Nice death star hack! Good to know they have instructions on their site, we’ve lost all sorts of them. Funny enough, you can even find classic set instructions off third party websites. I couldn’t believe it when I stumbled upon the classic space series instructions. Great job on the Death Star! That’s awesome. We got some basic bricks from Amazon for a pretty good price. They’re not LEGO, but works with them. I’ve purchased a few sets from Ebay too. That’s much cheaper than buying new in a box. What LEGO project do you think you’ll take on? Something grandiose like a Death Star or Disney Palace? We’re hoping that one of our neighbors with older kids is going to want to dump all their Legos soon and we can get them on fire sale. Cross your fingers! 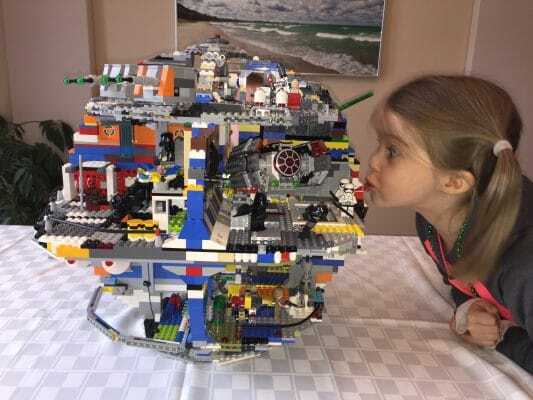 The joys of communal LEGOs offer many rewards. Granted, my daughter still keeps a bin separate for all of her kits. She’d rather not mix up the Friends and Little Mermaid with all the mish-mash her brother and father have collected. Can’t blame her! 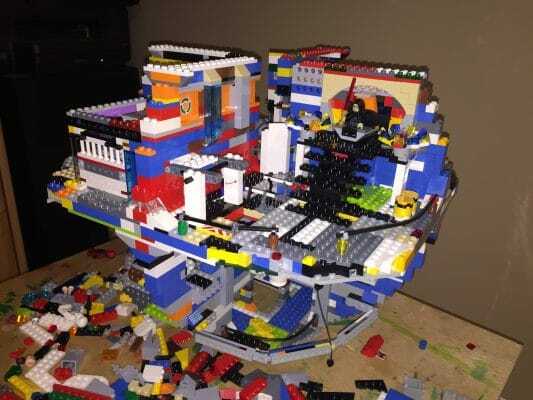 We have a Lego table down in our basement, and various Lego builds residing there in various states of disarray. There’s nothing better than hunkering down with a good set of Lego instructions and building something from the ground up. It’s a ton of fun. We had the 4 days off last week as well, and we finally got around to building one of the Lego sets my son was given at Christmas – a Minecraft Lego set. It is a fun idea, however, to download the instructions from the Lego site and build some of the projects on there using all of our spare parts. I think we have a project for our next cold snap! Ooohhh… A LEGO table! I’ve thought of that. A low slung surface with raised edges to keep pieces off the floor. Smart. How many pieces are in your son’s Minecraft set? 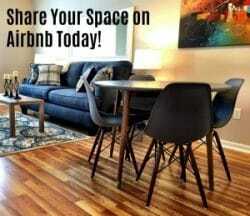 You’ll have to share if you stumble across a “download project” to take on. The Lego table is awesome, we used an old Thomas the Train set table that we already had and installed a bunch of green lego baseplates onto a fiberboard backing, and slid it into the table. It works great, but I was astonished at how much those little 12″x12″ green baseplates cost. We spent well over a hundred bucks on those alone. The Minecraft set we did looks to be about 457 pieces, so not tiny, but still a relatively small set. We’ll drop back by and share what set we end up downloading and trying if we do! Brilliant idea! I kinda wonder if MegaBlocks sells those flat panels. Anything LEGO is super expensive anymore. Maybe eBay to the rescue again? My mom actually thought ahead and saved a HUGE box of legos from when we were kids. My youngest brother (of the four of us kids) is 15 years older than my son, so they have had to store them for the last ~10 years or so, but they have the space and now our kiddo has a ton of legos to play with. Price per play is definitely pretty good at least! Great stuff ! I also grew up with Lego and perhaps that’s why I went into construction many years later !! Of course Lego back then wasn’t quite as elaborate as it is now, but still good fun. Your kids are showing an amazing creative streak – keep it up because as you say it is very educational. Thanks, Ben! 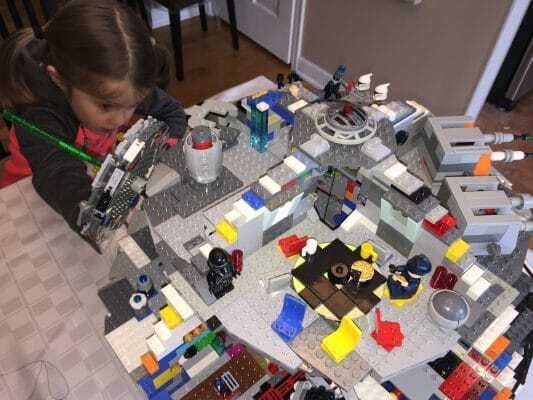 I can totally understand the connection between a LEGO youth and a desire later on to build stuff. At first I wanted to be an architect or civil engineer. Then I went for broke with City Planning. Haha. Really cool ideas here. My son loves Lego. He’s pretty picky about everything being exactly right, so I’ll have to see how he’d feel about things not being the right colors. If he could get past that, we could set him up with some videos, and it would really expand what he’s able to do. This post is so awesome I’m showing it to my husband. We were right in the thick of the polar vortex, so we stayed home with our little one. He would only put Leggo’s in his mouth at this point, but now my husband has something to look forward to in a few years… Cute kids btw!